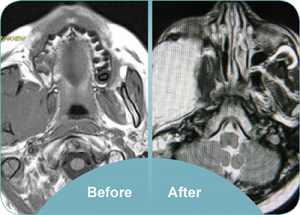 A large cancer of the skull base has been removed by Mr Davis and he has reconstructed the defect using a microvascular flap from the abdominal wall to restore facial contour. Charles Davis is part of a multidisciplinary team of surgeons that can safely remove many tumours that were previously considered inoperable. The skull may be “disassembled” using incisions inside the mouth, eyelids and scalp. Following tumour removal, the craniofacial skeleton is reassembled and replaced in its original position. Reconstructive surgery is used to restore the external tissue contours, a seal between the brain and the nose, tear duct drainage and a nasal airway.